Born in 1968, studied mechanical engineering, specialising in automation technology at the Ruhr University, Bochum. 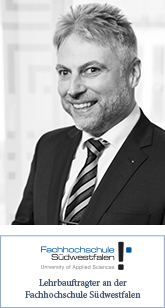 After subsequent academic work leading to a doctorate at the Faculty of Mechanical Engineering of the University of Dortmund, he worked as head of process management at Rexel Deutschland GmbH, before joining the office in 2002. Since 2005, he has been a partner in the practice. Dr. Ulrich Kötter is married with two children.